Unfortunately I'm unable to supply a cap with the FAW logo on it as this logo is a registered trade mark. 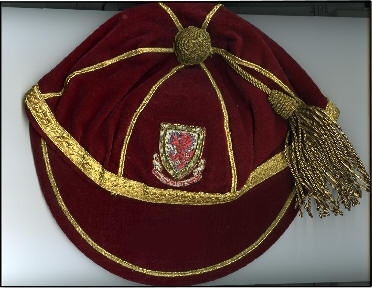 You would in effect have to obtain permission from the FAW to have a cap made like this. However, if you would like your own honours cap(s) made let me know as I can do virtually any design or colour scheme. The issue is the logo - it cannot be a registered trade mark or a design protected by copyright. If it is you need written permission from the owner. Manufacture takes between 4-12 weeks depending on how many you want and complexity of design.